> The classical picture of evaporation is still down to the statisical distribution of energy amongst the molecules of the fluids concerned. > Surface tension ie attractive force between the molecules of the liquid therefore represents a barrier which must be overcome and the stronger it is the smaller the rate at which molecules can escape to the gaseous region. This is true but the surface tension of water will not change much between 0 and 3C witch would be the Maximum temperatures in this area. Oil would form a barrier between the air and water and cap evaporation. The surface tension of the water would remain constant with the small temperature window for liquid phase. > The rate of evaporation is also dependent on the pressure of the gas, at lower pressure more molecules can enter the gas region, but as the saturation of the gas increases a balance arises whereby the rate of escaping molecules equates with the portion of those in the gas region capable of re-entering the liquid/solid region. In both leaving or re-entering the liquid or solid region the molecule must penetrate the surface tension barrier. As a result higher surface tension slows the rate of evaporation but also increases the saturation value of the gas phase. Pressure and temperature. Uropia orbits Jupiter with little atmosphere(no-pressure) and an Ice surface. Little sublimation occurs. Remember we are talking about Mars with a small temperature window and super lapse-rate The opportunity for change of surface tension due to temperature is negligible. 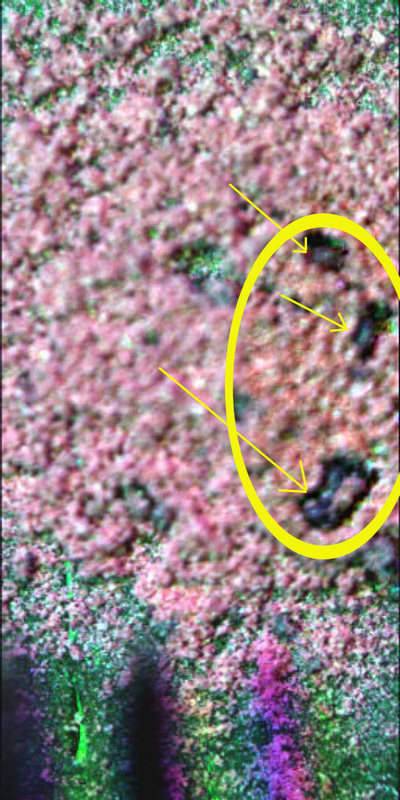 A little more detail from an area in your sol 81 weak magnet substrate image above. Circled and unsharp masked. Winston, I have given up trying to get anyone to actually study these images. I am extremely puzzled as to why the team has shown no interest in these OM details -- to the degree of not bothering run a focus sequence. Perhaps all the rock guys want to do is measure rock size distributions ( they make nice publication graphs ) -- and for that who needs a sharp image? There is already enough weirdness without sharp images. Maybe I should be on a different tour bus. As an aside, I have beem going back and adding sample wheel sample cell id and substrate type to the Flickr images. At some point you should be able to do a Flickr search for, say OM24, and see all the associated images in that cell. Say, why is this sample cell so interesting? The OM24 looks like a before and after sampling image. I can appreciate your frustration but let us wait and see if we get a focussing sequence over the next day or so. I don't know, but it may well be that Phoenix has to retain data in onboard memory pending transmission windows same as the MER. But I do wish we had the calibration data for images for LED illumination on control substances. Is the greenish mineral olivine, pyroxene or is it a different real colour than is apparent under the LED illumination? The magnet cells seem to indicate that the dust is an iron oxide (not surprisingly) but which one/mix. Ferric Oxide - Maghemite? The smoothness if the particles seems to indicate some significant transportation (fluid or aeolian) but that must have occurred a long time ago. But there is little anyone can analyse from the picture alone. Reference your Flickr comment, I think the capture of the dust speck was done during a calibration or rather set to work test and was serendipitous. I would anticipate that they would try and image a larger particle to get a good view of the surface. and the target should be visible in the OM. Don't leap off the tour bus just as the Grand Canyon is about to appear around the next bend. Some images of magnetotactic bacteria. 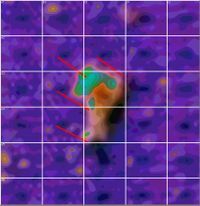 Seems to me our best hope of capturing an image of bacteria, if such exist at the Phoenix site, is with the magnetic substrate, since it might tend to increase the concentration within the sample. 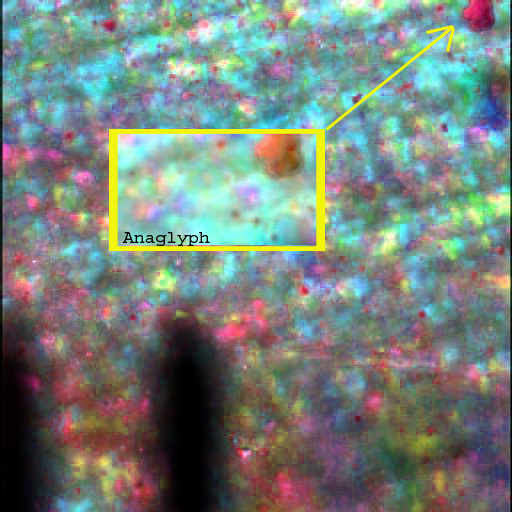 Here's an image of a relatively small dust particle on your OM24 substrate from sol 82. They took two series one at rotation position 2411 and the other at rotation position 2412. 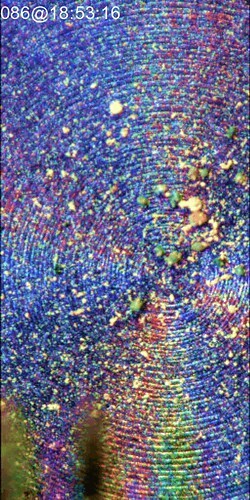 I did an anaglyph of the dust spot and embedded it in one of the RGB composites. I Think it may be possible that they are using OM24 for further calibration. The guys must really like this sample cell. I am sure that they are all enjoying the "joke" droplet that refuses to go away. sol 83 OM25 ( nanobucket ) and OM23 ( weak magnet ) - with the usual inscrutable particles ( Martian?, Terrain? ?, Jovian?? ?, Alpha Centurian????) scattered about. Oh, and another Mister In-Between. You've all know what happens when you Mess with Mister In-between? OK, it's sol 4 and wheee! OMs at last. Hmmm. Funny looking thing that. Er, wonder what it is? It looks just like a droplet! Ha! No more raw OMs for you! A totally feeble-minded, lame excuse is provided for the lack of raw OM images ( Er, we couldn't figure out what to tell you about how the image was taken... ) and the OM tap for the internet tubes is turned back on. One team scientist Tom Pike, publically ridicules the report of alien droppings - but is silent on the OM24 droplet feature. What annoys me more than anything in the entire world is silence. Perhaps in a few centuries when I am returned to silence forever - when, in the grand scheme of things, I will have only begun to be dead forever, then - perhaps then -- someone will retrieve the Phoenix craft for the Martian Museum of Science -- and then in a few more milenium a graduate student funded by the Peter Smith Scholarship specializing in ancient Earth technology will open it up while preparing it for display and say to a colleague, say, that's funny: sample cell OM24 has a droplet of somethinf on it that looks just like a drop of water! They both laugh and enjoy the joke. An infinite amount of time passes. And then will I smile a little smile too. So it would kill you to take 3 more pictures so a real extended depth of field color picture could be created? Oy Vey. 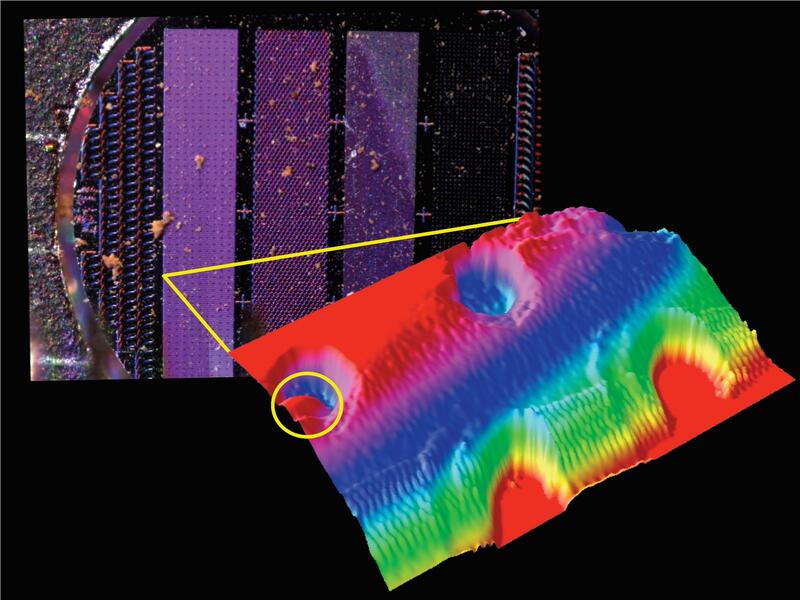 This is a page link from the newer AFM, Atomic Force Microscope images recent releases, and is a OM view of the array built by Imperial College London, showing many small 'particles' as we are viewing routinely. Upon studying this for a few enlargements, I had to work the 'drumstick'(chicken leg, for those who are vegetarians, or countries with no chickens). It was a mystery unfolding from start to finish. Do these observations match many of the other particles? I can see a correlation to at least one other large particle here, and I'll work that and report if the two are showing my mystery pattern. We have been hearing remarks from several, or most persons on marsroverblog about the cohesiveness and 'stickiness; of the soil and it's particulate collection. 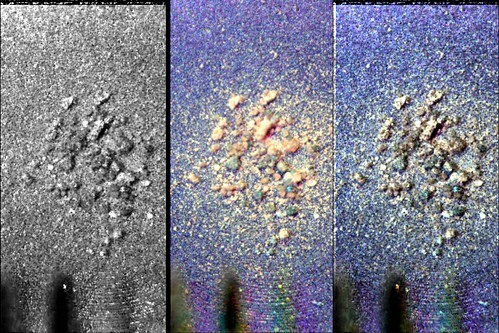 We are even seeing the thin films of molecular attraction to the scoop, screens, and other parts of the Phoenix lander. This is fairly clearly a real and important characteristic of the Martial soil at the Phoenix site region. My attempt to image resolve this 'drumstick' shows that the material is not appearing to be rigid, even in the cold, and even with the water content as 'ice'. This shows signs of a drapery, a film, and a cohesive structure of a thin film nature. The pegs in the array are 3D. They have a height and a stressing effect on a particle. 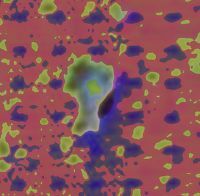 Depending on the lack of resolution, fuzzy focus, and the file transfer methods to my image download, I see a draped set of two pegs, covered by a 'membrane' or film, not a particle as a soil mineral mix of finer grains. I used for these images a series of 32 tone mapping, line enhancement, adjustments by hand in contrast and hue changes, but basically a faithful full image transfer of the 700% enlarged view of the peg centered on the drumstick as forcing a lighting change to near normal brightness above the white circle in the marked final image. The peg location for the white circle should actually be just to the left and low of the white circle, as I deliberately placed that line to the right of the alignment path. I can see a faint but real green circle to match even the white circle peg, the second to alter the surface shape of the particle, and still show a cohesive surface drapery effect across the array pegs. The dark spots all match the pegs and the lighting source as upper left. The diminution of the white circle spot may be caused by the thinness of the drumstick, the darkness of the associated close main body shadow, or other unseen effect. While there is discussion of the array as a series of pits, and on other pages a mention of pegs, elevated, the array contains both type of registers for particles. Can this be just a loss of resolution in the coverage of this particle, or, is this really a flexible thin film membrane like structure as it appears? Is the material not rigid, by a combination of parts and a finer scale device than can be viewed here? Er, what!? see Flickr comments for comment. er, reply 194 are sol 83-86 changes. Here are some more. There are 10 sample groups for the OM and an extended mission. While I have never seen any reference to re-use, it would make good applied common sense to scrape the sample cells off for possible re-use of the cell. Sure there would be some residue, and the sticky silicone would probably resist, but for the strong and weak magnets re-use would seem plausible. The strong magnet at post 194 certainly looks scraped to me. Just a thought. With respect to post 190, I can understand that they would watch the silicone substrate in this cell. The bubble and surrounding area looks like a failure of the silicone layer to stick correctly to the underlying base. While obviously considered low risk they would want to keep an eye on it to ensure it didn't lift further post transit and landing. Re. the post 190 silicone, Did'nt they say that they were re-exposing some cells, presumably to get some idea of aerial transport of dust? My only problem with this is possible contamination of nearby cells but this really should'nt matter very much if one is trying to get some idea of the variety of dust particles in the environment. The numerous reimagings of OM24 probably have to do with reexposures. Could be - in fact you are probably spot on. I didn't see any comments on re-exposing cells but it makes sense with such a limited number of sample cell groups. 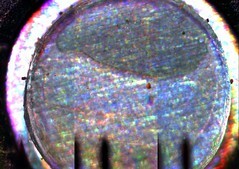 The scraping seems to be a closer tolerance than the original sample preparation scrape for imaging. But hey, it could well have been that the strong magnetic influence clumped the magnetic particles so that the height of the sample was above the scraper clearance when it was again exposed. If the magnetic attraction held the sample together after exposure to the atmosphere and the scraper took off the whole sample then it would have acted as a zero clearance scraper in its own right. Mystery solved. I'm basing my perception of checks of OM24 on the fact that it was checked on Sol 5, the only cell in group 3 to be imaged on that day. My boolean based thought processes tell me that this means that they knew that there was something that they wanted to check on in relation to that particular cell. So they were therefore aware of the anomaly before launch and wanted to check if it had changed during launch and transit. Regardless, it is certainly is not a water droplet as has been implied in this forum. Firstly, it was imaged well before the cell group was opened for sample collection so it did not come from the Martian environs. Third, It has not changed in any way even when it has been exposed to sub zero temperatures and near vacuum for collection of a sample. QED - it isn't a volatile liquid. It looks like groups 2,4 and 5 are being "saved" for a "rainy day" ( snowy day?) My guess is the sample wheel has been rotated in such a way that these 4 and 5 groups have never come into direct contact with the sample delivery subsystem and that the unspecified OMs were from group 2. So: 21 of 60 sample cells have been used by sol 88 in a 90 sol - maybe 120 sol - mission. "Scraping for reuse" this late in the mission with so many unused cells would seem ,to me, unlikely. But I have no more insight into the workings of the giant scientific brains that are charting this mission than I do of any other chaotic system, so I could be wrong. In fact I am frequently wrong about what motivates the furry little apex predators on the third rock from the sun. OM27 was first imaged on sol 83 along with a focus zoom sequence that produced the clearest details of "greenish" particles in the soil. 3 sols later OM27 was scraped. My guess is that a deliberate attempt was made to break apart the soil particles -- especially the curious cylindrical shaped one. Er, Brian, it has not been implied by me that the "drop" is a liquid drop -- only that it "looks" like one. Observationally, it has not changed shape or position. A droplet of gas in a solid medium would behave almost the same way in terms of the lensing effects that I noted. So, Brian, you have an offical source stating publically that the "droplet" is in fact a bubble in the silicone? References please. Why do you believe that this "bubble" is a danger to the OM? In fact hasn't changed at all since sol 4. Say, what do you see when you look at the OMs up close and personal? Anything "interesting"? In my prior reply of #193, I offered a few images which were heavily altered and enlarged. Those images have a flaw I didn't pay attention to when posting in a hurry, and I made a few wrong statements and assessments of the details in the images as a result of a busy schedule and too hurried a posting. The prior images were 'solarized' at a medium setting first, and I had forgotten to make that adjustment in my statements. The brightest tones and some darker tones were brought together in part of the tonal range, and other dark tones were altered to bright tones. The end effect is a true image-wide alteration of common appearances. The process has great value at times, and non-the-less, those images are too complex to describe here, so, I'll issue a substitute with explanation, making the viewing easier. This is a correction, with a different image, which is much less altered, but which carries the information I was trying to issue in reply #193. 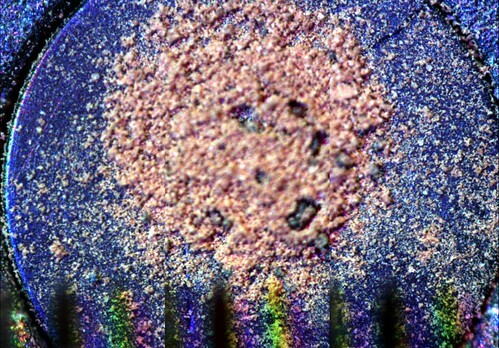 This is a 900% enlargement of the 'drumstick' particle or clump, on the array grid. I was struck by the odd correlation of bright points to the grid points, the slumping or draping of what appears continuous membranous flexible material across the center hidden pit (marked in this image as grid sector A3,C1), and the lower missing grid point not seen at all(marked in this image as A4,C1. Some aspect of the image capture and transfer has given a set of matching brightest tones in the image(displayed here as shades of green) with angle alignment and reasonably fixed distances to the grid dark points which are in alignment with the lighting source from the upper left. I did no editing when reducing the number of tones, but pixel edge alignments may be partly responsible for some lighting shifting within pixel domains. I saw this alignment in the original tiny particle view, and the Phoenix camera system may somehow produce a resonance pattern with the grid of the array. 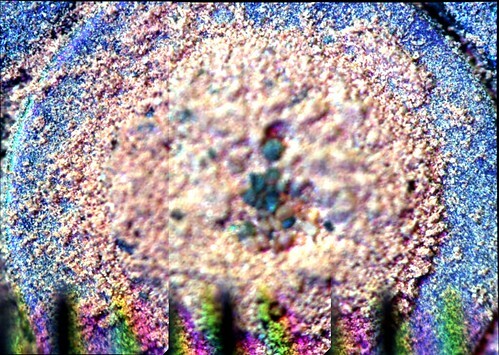 The darker 'draped' center point at A3,C1, also shows a similar shading association with the extreme dark shaded side of the particle, in the low tonal realm. I did not mark that angle or distance, leaving the view open and with your observations. Other particles are 'draped' across the raised array parts in a flexible and cohesive membrane type of adhesive attachment appearance. Has anyone developed a content suggestion for the qualities? Again, the greens are the original image brightest tones, altered to show the few percent brighter qualities of the tiny areas. The originals are link at reply #193.